In the pages of Jonathan Bailor’s latest bestseller The Setpoint Diet book, you’ll find a scientifically proven, simple way to lose weight permanently. Without hunger. Without deprivation or misery or guilt or shame. The Setpoint Diet book doesn’t make you count calories or points. It doesn’t give you endless menus you must follow exactly to reap weight-loss results. Nor does it include complicated rules to remember. Does this sound like any diet you’ve tried in the past? No? Well, that’s because The Setpoint Diet book is wonderfully different from any other traditional diet. We’ll explain why in a moment. Suffice to say, for now, if you let the principles contained in The Setpoint Diet book sink in, and you start eating SANE foods and practicing SANE lifestyle upgrades, you’ll experience the joy of effortless weight loss. Stay with it, and you will even experience, perhaps for the first time in your life, what it is like to live in the body of a naturally thin person. We know. You’re probably shaking your head right now, wondering when we’re going to reveal the big catch. You’re probably thinking these claims about The Setpoint Diet book, and its effect on your weight, are “too good to be true.” We totally understand your skepticism. If you struggle with your weight, you’ve surely been let down (to say the least!!!) by other diets. Take a minute right now and think about how many diets you have tried over the years. How many total diets have you tried, and how many of them failed you? All of them? How much weight have you lost on those diets, only to gain every last pound back — every time?!!! Statistics show more than 45 million American adults go on a diet each year and that the average dieter makes 4-5 weight-loss attempts per year. Obviously, if “traditional” starvation-type diets worked, millions of people wouldn’t be dieting. There also wouldn’t be a worldwide obesity epidemic, and the weight-loss industry in the U.S. wouldn’t be raking in upwards of $108 million per year. It has been clear for a long time that starvation dieting doesn’t work. Experienced dieters know starvation dieting doesn’t work for long-term weight loss. Scientists have also known for a long time that starvation dieting doesn’t work and is even counterproductive to long-term weight-loss success. But somehow, this information never made it into the “mainstream” weight-loss community. The Setpoint Diet Book is the result of more than 15 years of research — scientific, clinical, peer-reviewed research studies — showing how the metabolism really works. This research reveals that the quantity of calories consumed — the main focus of most traditional diets — is NOT the most important factor in weight gain, weight loss, or weight maintenance. You see, there’s an invisible force inside you that is working to cling to extra pounds, and it has nothing to do with calories, points, mail-order meals or any of the traditional health and diet quackery you’ve been taught. The fact that you’ve been given incorrect information is precisely why these diets have failed you over and over and over for most of your life. What’s really holding you back—and what can permanently set you free—can be summed up in a word: setpoint. And it’s something you can control. When you control it, you stay naturally slim. So what is a setpoint? The human body is an extremely complex biological machine. Your brain, your digestive system, and your hormones all work together through a highly coordinated system to help stabilize your body weight and blood sugar—the same way they automatically stabilize your body temperature and blood pressure. Your brain, digestive system, and hormones talk to one another through various feedback loops to synchronize the activities that automatically maintain body fat at a specific level. This is your setpoint weight. The biological feedback system that establishes your setpoint is similar to the thermostat in your house. Thanks to the thermostat, your heating or air-conditioning system respond to the weather outside and keep your home at whatever temperature the thermostat “thinks” it should be at. Similarly, your setpoint stimulates or suppresses your appetite and raises or lowers your metabolism in response to how much fat it “thinks” you should store. So, the minute you go on a starvation diet, your body goes on emergency alert. Hormones signal your brain that you’re not eating enough to maintain the bodily functions needed to keep you alive. The hypothalamus in your brain responds by increasing levels of the hunger hormone ghrelin to get you to eat more food. If you manage to ignore the ravenous hunger that ensues, your hypothalamus releases or increases levels of hormones that make you weak, cold, shaky, irritable. It also lowers your metabolism and sends most of the calories you consume directly to your fat stores. Additionally, when threatened with starvation, the body retains its fat stores as much as possible. Instead of burning fat for energy, it burns muscle. A loss of muscle mass further slows the metabolism. When you finally go off the diet — because who can take such hunger and misery for a long period of time? — you’ll likely gain all the weight back plus several more pounds. This is because the body overreacts to being starved. You see, the diet itself slows your metabolism and elevates your setpoint weight. So, starvation dieting leads to a heavier you in the long run! Starvation dieting works only for short-term weight loss. The only way to lose weight long term is to lower your setpoint weight. Once you learn how to lower your setpoint weight, as you’ll learn in The Setpoint Diet book, you lose weight safely and effortlessly. You’ll eat until you’re full — delicious, real foods — and you’ll feel wonderful. Everything you do either raises or lowers your setpoint weight. But the three main factors that elevate your setpoint weight are poor-quality diet, stress, and sleep deprivation. The traditional dieting industry is based on the calorie-deficit theory of weight loss. That is, if you create a calorie deficit in your body, you’ll lose weight. You can create this deficit either by burning calories off through exercise or by consuming fewer calories than your body needs. And, this theory goes, it doesn’t matter what types of foods you consume as long as you maintain a calorie deficit. Sadly, this is not the case. Research shows calories vary widely in their effect on the body. The effect calories have on your body depends upon the food from which they come. In other words, it is the quality — not the quantity — of calories that affects your health and your weight. Research shows that overconsumption of poor-quality foods — such as highly processed foods, starchy carbs, and sugar — elevates setpoint weight. That’s because these foods cause hormonal clogs, preventing your hormones from sending correct signals to your hypothalamus. (The hypothalamus regulates your metabolism.) Poor-quality foods also cause neurological inflammation and gut dysbiosis, both of which prevent the body from metabolizing calories correctly. If you have been struggling with your weight, if nothing you have tried has ever worked to keep the weight off long term, you’re in for a treat. The Setpoint Diet book takes you by the hand and shows you how you can achieve effortless and permanent weight loss. It reveals the foods scientifically proven to lower your setpoint weight. Regularly consuming these SANE foods will reverse the effects of years or decades of consuming inSANE foods. Lowering your setpoint weight is as simple as upgrading your diet. Of course, there are other SANE lifestyle upgrades that are important in lowering your setpoint, too, but diet is one of the most important factors. And don’t let the phrase “upgrading your diet” scare you. As the Setpoint Diet book reveals, you’ll eat real, easily accessible foods. There is also a SANE substitution for every inSANE food (except for those highly processed “food-like” products.) You’ll love the way SANE foods taste, and you’ll love how they make you feel. You’ll have more energy, and you’ll be able to sleep better at night. How amazing is that?!!! The second factor that elevates setpoint weight is chronic stress. There are many physiological reasons why chronic stress elevates setpoint weight. When you’re stressed, your body releases extra glucose to give you the energy to fight or flee the threat. Your adrenal gland release the stress hormone cortisol which, among other things, triggers a release of insulin to usher this glucose into your cells. So as you can see, stress causes elevated levels of glucose, cortisol, and insulin, all of which can cause weight gain. Our caveman ancestors didn’t have to worry about weight gain because they dealt only with the short-term stresses of an actual life-or-death threat. For instance, they burnt off their excess glucose levels during their fight with the bear. After the threat had passed, the relaxation response set in, returning their cortisol and insulin levels to normal. They didn’t experience the “fight-or-flight” response unless their lives were actually threatened. That’s not how modern men and women handle stress. Most of us are chronically stressed, treating every problem as a life-or-death situation. The body reacts in kind. But since we’re always stressed, the relaxation response never occurs. Instead, our glucose, cortisol, and insulin levels become chronically elevated. This not only elevates setpoint weight and leads to weight gain, but it also increases the risk for type 2 diabetes and other chronic diseases. Try to de-stress every day. Meditate. Take a leisurely walk around the block. Read a good book. Practice deep-breathing exercises. Go hiking with friends. Anything you love doing will de-stress you. The problem is that many studies indicate that sleep deprivation leads to weight gain. These studies suggest sleep deprivation dysregulates hormones, causing excessive hunger and craving for starchy carbs. Sleep deprivation has also been shown to increase levels of cortisol, leading to an accumulation of belly fat. Make high-quality sleep a priority. Try to get at least 8 hours of sleep every night. One way to get more sleep every night is to maintain a regular sleep schedule. Go to bed at the same time every night, and awaken at the same time every morning — even on weekends. 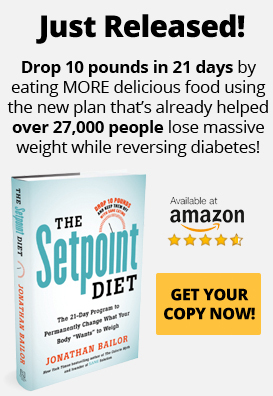 The Setpoint Diet Book: Are You Ready for the 21-Day Challenge? The Setpoint Diet book contains all the information you need to lower your setpoint weight. You can accomplish this goal as slowly or as quickly as you’d like. If you want to take it slowly, simply follow the general SANE dietary and SANE lifestyle guidelines. But if you want to see quick results, The Setpoint Diet book includes a plan to help you do just that. The 21-Day Challenge portion of The Setpoint Diet book provides all the tools and strategies you need to lower your setpoint weight as quickly, easily, and safely as possible. The 21-Day Challenge helps you lose 10 or more pounds in just three weeks. And unlike other diets you’ve tried, you will not be hungry, weak, or irritable. You will not feel deprived. And because the 21-Day Challenge helps you lower your setpoint weight, the results will be permanent. After you complete the 21-Day Challenge, you can either switch to the regular Setpoint Diet, or you can do another cycle of the 21-Day Challenge. It is totally up to you. The Setpoint Diet book is on sale NOW. So, what are you waiting for? Click here to order this amazing book. You don’t have anything to lose…except your excess weight!